Cats have an uncanny ability to curl up and fall asleep just about anywhere—the cozier the spot, the better. Tiziana Agnelos, founder of a company called LoveThyBeast has created a product where cats (and even small dogs) can catch some Zzzs or just relax and unwind in high style. The four-sided pyramid-shaped cardboard pet house is as easy to assemble as it is to take apart so your furry friend can feel right at home wherever you go. TheLoveThyBeast Pyramid includes a corrugated bottom liner that doubles as a scratch pad and nap surface. It even comes with three cardboard cut out toys for when your pet is feeling playful. The only thing that rivals Tiziana’s love for animals is her passion for American manufacturing. She is on a first name basis with Makers at textile mills, solid brass distributors, and cardboard manufacturers all located within 200 miles of her Brooklyn studio. Made in the USA through and through, the Pyramid is constructed of 100% recycled cardboard and printed using soy based inks and acrylic coated paint making it simple to clean, animal safe, and wildly stylish. Catnap, anyone? Cats have an uncanny ability to curl up and fall asleep just about anywhere—the cozier the spot, the better. Tiziana Agnelos, founder of a company called LoveThyBeast has created a product where cats (and even small dogs) can catch some Zzzs or just relax and unwind in high style. The four-sided pyramid-shaped cardboard pet house is as easy to assemble as it is to take apart so your furry friend can feel right at home wherever you go. 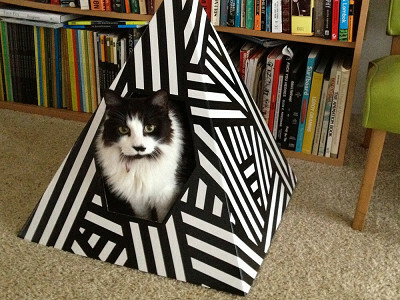 TheLoveThyBeast Pyramid includes a corrugated bottom liner that doubles as a scratch pad and nap surface. It even comes with three cardboard cut out toys for when your pet is feeling playful. The only thing that rivals Tiziana’s love for animals is her passion for American manufacturing. She is on a first name basis with Makers at textile mills, solid brass distributors, and cardboard manufacturers all located within 200 miles of her Brooklyn studio. 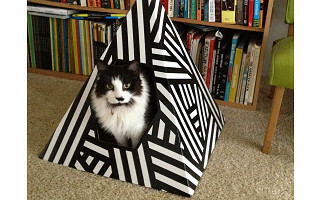 Made in the USA through and through, the Pyramid is constructed of 100% recycled cardboard and printed using soy based inks and acrylic coated paint making it simple to clean, animal safe, and wildly stylish.